Prayer. As Christians, it’s something that we all do. Hopefully it is something that we all pursue to do more of. Prayer is our communication link to God–it is the way we talk and connect with Him. Here we can tell Him our thoughts and feelings, our worries and our needs, and also give praise and worship. If God is all powerful and knows our thoughts and heart, then why do we need to express them out loud to Him? Why do we need to talk to God if He can hear our conscious thoughts? I guess the simplest answer to this question would be because God wants us. God wants you–every part of you. He wants to be in every part of your life, the good and the bad. He wants to be your Father and your friend. He wants to talk with you and listen to you. He wants to help you and love you. He also wants to hear how much you love Him. We are God’s children, and like any good father, God will do anything to pursue a deeper relationship with us! If anything would make me want to pray, that last sentence certainly does. Jesus is not only one with God, but He is one with us. When we talk to Him, we are only going deeper into our communion with His Holy spirit. That they all may be one; as thou, Father, art in me, and I in thee, that they also may be one in us: that the world may believe that thou hast sent me (John 17:21 KJV). Okay, so now we understand the importance and power of prayer, but how do we pray? Matthew 6:9-13 gives us the model prayer, which is a great structure for any prayer that you may have, but there is another verse in this chapter that I am interested in. But when ye pray, use not vain repetitions, as the heathen do: for they think that they shall be heard for their much speaking (Matthew 6:7). Praying is talking. When we pray to God, we have to remember that we are talking to Him. He already knows what’s going on in our hearts and minds anyway, so there is no point in trying to hide. If you are upset or distracted, then just tell Him! 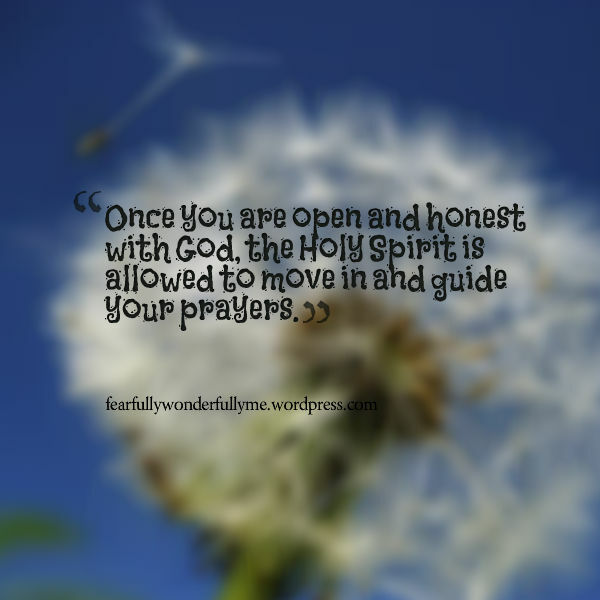 Once you are open and honest with God, the Holy Spirit is allowed to move in and guide your prayers. We need to come to God in respect and awe, asking for forgiveness for our sins. If there is anything bothering you then ask God to show you what needs to be dealt with. Then feel free to start ranting to God! Remember that Jesus is always interceding on your behalf, and you can say anything to the Lord. Whether you are talking more casually, or pouring your heart out through tears, God will always listen and be moved by your voice. If you aren’t praying in the Spirit then I urge you to seek the gift of tongues. I can’t begin to tell you how amazing it feels to just let your spirit pour out to Jesus when you don’t know the words to pray (See Acts 1,2 and 1 Corinthians 14:2). Even though we sometimes feel the pressure to pray a certain way in public, God wants us to just be ourselves! He will always be there to listen to you–all you have to do is call out His name! In my distress I called upon the Lord, and cried unto my God: he heard my voice out of his temple, and my cry came before him, even into his ears (Psalm 18:6). Sorry my last couple of posts were late! A lot has been happening around here lately (including getting ready for a craft show), and I wanted to make this a proper post ^_^ Thank you for your patience! “IF you can’t pray…talk to God about it.”–old folk sayinng. It just came up, out of the deep memory files….from a United Methodist “Lay Witness Mission” many…many…moons ago, I think! WITH WHOM ELSE CAN WE BE SO HONEST???? Thanks for reblogging! And yes, God is our closest friend and counselor.